Keywords: Arthroplasty, Drug Resistance, Joint, Microbial, Prosthesis-Related Infections, Revision, Total Hip Arthroplasty, Total Knee Arthroplasty. Periprosthetic joint infections (PJIs) after total knee arthroplasty (TKA) and total hip arthroplasty (THA) are rare but devastating complications, affecting approximately 2-3% of joint replacement patients . The problems posed by PJI are multiplex. First, they often present a diagnostic dilemma [2, 3]. Staged procedures are usually necessary, before attempting definitive revision reconstruction [4, 5]. PJI significantly reduces the long-term quality of life (QoL) of affected patients , and the economic consequences of PJI to the health care system are significant. There are over 100,000 orthopedic prosthesis-related infections annually in the US, with each representing $15,000-30,000 additional hospital costs . Mean PJI treatment cost is approximately 3 to 4 times that for primary joint replacement, and the average cost of revision THA for PJI is approximately $6,000 more than for TKA-associated PJI . 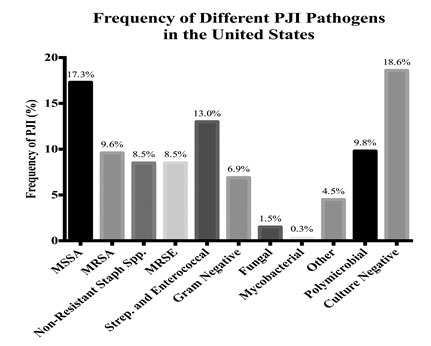 When the causative pathogen is a resistant organism, such as methicillin-resistant Staphylococcus aureus (MRSA), the mean PJI treatment cost increases nearly 60% compared to PJI caused by more susceptible microorganisms . The annual hospital cost of treating lower extremity PJI increased from $320 million in 2001 to $566 million in 2009 . The increasing incidence of PJI associated with resistant pathogens may partially explain this observation [5, 9]. These trends are worrisome, and the annual economic burden related to PJI has been projected to surpass $1.62 billion for the US in 2020 . The financial implications of PJIs are related to the complexity of the solutions these problems require. Outcomes after PJI treatment are plagued by high failure rates, and PJI may ultimately result in arthrodesis, amputation, or mortality . Identification of a pathogen increases the likelihood of treatment success . However, a causative organism is not identified in 10-30% of PJIs , and atypical or drug-resistant microorganisms are responsible for a growing percentage of PJIs [9, 12]. The purpose of this review is to summarize the current state of clinical epidemiology, diagnosis and management of this challenging group of PJIs, which are either related to resistant or atypical pathogens or associated with a culture-negative diagnosis. Approximately 15% of revision THA and 25% of revision TKA are performed for PJI [13, 14]. In general, as the number of TKA and THA performed has increased, the gross number of hip and knee PJIs has also increased . However, there has also been a measureable increase in the annual frequency of PJI as a percentage of total THA and TKA performed. Kurtz, et al. used the Nationwide Inpatient Sample (NIS), a representative 20% sample from approximately 1,000 US hospitals, to estimate TKA and THA PJIs from 2001 to 2009 and to model the PJI incidence through 2020. They found that the percentage hip PJI significantly increased from 1.99% in 2001 to 2.18% in 2009, and knee PJI significantly increased from 2.05% to 2.18% over the same period. They projected that over 16,000 infected THA procedures and nearly 49,000 infected TKA procedures will be performed in 2020 nationally . The prevalence of PJI caused by resistant pathogens and atypical pathogens is also increasing [9, 12, 15], exceeding 50% of PJIs in some series . Resistant PJIs are likely significantly more prevalent in the US than in Europe. Aggarwal, et al. reviewed all PJIs treated between 2000 and 2011 at two major PJI referral centers, one in the US (772 PJIs) and one in Europe (898 PJIs). The incidence of methicillin-resistant Staphylococcal species was 49.6% for all PJIs in the US and 37.0% in Europe (p=0.0002). The incidence of methicillin resistant S. aureus isolates was significantly higher in the US than Europe (48.1% versus 12.8%, p<0.0001), but there was no statistical difference in PJI caused by methicillin-resistant S. epidermidis (MRSE). Twenty-seven percent of Enterococcus PJIs were resistant to vancomycin in US PJI isolates, whereas no European isolates were vancomycin-resistant. The incidences of culture-negative PJIs were similar . In two studies of Medicare patients, Bozic and colleagues reviewed the risk factors for PJI in 40,919 patients receiving primary THA  and 83,011 patients who underwent primary TKA  between 1998 and 2007. For THA, rheumatologic disease, obesity, coagulopathy, and preoperative anemia were significant risk factors for PJI . For TKA, independent risk factors for PJI, in order of decreasing significance, were congestive heart failure, chronic pulmonary disease, preoperative anemia, diabetes, depression, renal disease, pulmonary circulation disorders, obesity, rheumatologic disease, psychoses, metastatic tumor, peripheral vascular disease, and valvular disease . The reliance on Medicare claims data, which is dependent on administrative coding and which may not accurately reflect the clinical record however, limits the results of both studies. In a recent systematic review and meta-analysis, which included the studies by Bozic, et al. [17, 18], Zhu, et al. found that the following factors were significantly associated with PJI: body mass index (BMI); diabetes mellitus (DM); corticosteroid therapy; hypoalbuminemia (<34 g/L); rheumatoid arthritis (RA); blood transfusion; wound drain device; wound dehiscence; superficial surgical site infection (SSI); coagulopathy; malignancy; immunosuppression; National Nosocomial Infections Surveillance Score (NNIS)  ≥2; other nosocomial infection; prolonged operative time; and prior surgery. Of these, morbid obesity (BMI>40 kg/m2), steroid therapy, hypoalbuminemia, wound dehiscence, SSI, NNIS, nosocomial infection, previous surgery, and prolonged operative time were associated with a greater than 2-fold increase in the odds for developing PJI . Notably, cirrhosis, hypothyroidism, urinary tract infection (UTI), illicit drug abuse, alcohol abuse, ischemic heart disease and renal disease were not significantly associated with PJI , despite them being cited as risk factors in other studies [21-24]. Expert consensus strongly agrees that history of previous surgery, poorly controlled diabetes mellitus (glucose > 200 mg/L or hemoglobin A1c > 7%), malnutrition, morbid obesity, active liver disease, chronic renal disease, excessive smoking (>1 pack per day), excessive alcohol consumption (>40 units per week), intravenous drug abuse, recent hospitalization, extended stay in a rehabilitation facility, male gender, diagnosis of post-traumatic arthritis, inflammatory arthropathy, and severe immunodeficiency are all risk factors for SSI and PJI . Risk factors for PJI with resistant and atypical microorganisms include prior documented colonization or infection with the pathogen, institutionalization, renal dialysis, and health care vocation . Clinical consideration for atypical pathogens, such as echinococcus species, should be considered in patients presenting from endemic areas, and Mantoux testing should be performed for patients presenting from regions in which tuberculosis is common . Risk factors for specific organisms more commonly encountered are discussed below. Staphylococcus species account for the majority of PJIs in the US and Europe . MRSA is typically a coagulase-positive Staphylococcus that accounts for nearly 10% of pathogens isolated from PJI in two, large referral centers in the US (Fig. 1) [12, 16]. Methicillin resistance in coagulase positive Staphylococcus is more common in the US than in Europe . S. epidermidis is a coagulase-negative Staphylococcus species. PJI with coagulase-negative Staphylococcus is more common in Europe than in the US, although there is likely no difference in the frequency of methicillin-resistant isolates from PJI related to coagulase-negative Staphylococcus in these two geographies . Fig. (1). Bar graph depicting estimated pooled frequencies of isolated pathogens from 1,557 hip and knee PJI treated at two large orthopedic surgery referral centers in the United States [12, 17]. Historically, MRSA PJIs were nosocomial and primarily affected compromised hosts. Over the last two decades, community-acquired MRSA (CA-MRSA) infection has become increasingly common . Both hospital-acquired MRSA (HA-MRSA) and CA-MRSA have acquired one of six distinctive staphylococcal cassette chromosome mec (SCCmec) mobile genetic elements, which include the mecA gene coding for a modified penicillin binding protein 2a (PBP2a) that confers resistance to β-lactam antibiotics . MRSE also acquires β-lactam resistance through the mecA gene . All MRSA strains produce biofilm, which confers up to 100 times more antibiotic resistance than non-biofilm-producing bacteria . CA-MRSA strains also express Panton-Valentine leukocidin (PVL) and phenol-soluble modulins (PSMs) that increase their virulence and the destruction of leukocytes [32, 33]. The USA300 strain accounts for more than 60% of CA-MRSA isolates in the US. The SCCmec IV element, which is smaller and more efficiently transferred between bacteria than other SCCmec elements, is characteristic of this strain . Additional strains of Staphylococci have emerged with plasmids and other genetic mutations conferring resistance to rifampicin, linezolid, vancomycin and daptomycin [35, 36]. PJI = periprosthetic joint infection; MSSA = methicillin-sensitive Staphylococcus aureus; MRSA = methicillin-resistant Staphylococcus aureus; MRSE = methicillin-resistant Staphylococcus epidermidis. Enterococcus species are Gram-positive organisms that comprise part of the commensal gut flora. Approximately 3-10% of PJIs are infected with Enterococci [12, 16, 37, 38], with THA being more commonly affected than TKA [12, 37]. Enterococcal PJI typically portends a poor outcome [37, 38]. E. faecalis is the most frequently isolated species , and up to 33% of isolates are vancomycin resistant (VRE) . Tornero, et al. reviewed 203 Enterococcal PJIs from 18 European institutions from 1999 to 2012. Sixty three percent of PJIs affected hips, and in 89% the causative species was E. faecalis. Of note, in this series 54% of PJIs were polymicrobial . Vancomycin is a glycopeptide antibiotic. Enterococci can exhibit several types of glycopeptide resistance through acquisition of genes influencing the enzymatic processing of peptidoglycan precursors [39, 40]. High-level resistance is observed clinically in E. faecalis and E. faecium, with VanA, VanB, and VanD type resistance. Glycopeptide resistance is conferred through loss of a hydrogen bond at the glycopeptide binding site through a substitution of the N-acyl-D-Alanine-D-Alanine terminus of peptidoglycan precursors with acyl-D-Alanine-D-Lactate. This substitution lowers the affinity for vancomycin to its binding site by three orders of magnitude . VanC, VanE and VanG exhibit a different mechanism of resistance to vancomycin only, whereby the acyl-D-Alanine-D-Alanine terminus is replaced by D-Alanine-D-Serine. This substitution alters vancomycin affinity for its binding site by 6-fold secondary to the increased bulk of the hydroxymethyl group of serine compared to the methyl group of alanine . There are numerous Streptococcus species, which are Gram-positive bacteria. Many of these represent commensal flora of the oropharynx and gut , and they rarely cause PJI. S. viridans is a common cause of transient bacteremia following dental procedures . In one large series of PJI , a statistically increased incidence of this species was observed in PJI between 1998 and 2011. Overall, S. viridans was the causative organism in 3.7% of PJI. Although there is controversy regarding antibiotic prophylaxis for dental procedures, the authors suggested that this practice deserves continued consideration given their results . When S. Bovis and other Streptococcus species usually found in the bowel are isolated from PJI, a lesion, such as carcinoma, in the alimentary tract should be suspected . Gram-negative (GN) bacteria include organisms such as Escherichia coli, Pseudomonas, Enterobacter, Proteus, Pasteurella, Serratia and Klebsiella species. These bacteria represent the causative organism in approximately 4-7% of PJIs in large series [12, 25], and their management is typically considered challenging . They appear to affect THA and TKA equally . Zmistowski, et al. reviewed 31 patients with GN PJIs. Enteric organisms, including E. coli, were isolated in 30.2% of these cases, and P aeruginosa was isolated in 25.5%. Resistance to third generation cephalosporins was noted in 4 cultures (12.9%), ciprofloxacin in 4 cultures (12.9%), and gentamicin in one culture (3.2%) . Mycobacterium tuberculosis (TB) PJI represent approximately 0.3% of PJIs , and PJIs with nontuberculous mycobacteria (NTM) species and M. avium complex (MAC) are limited to even rarer case reports, which have been reviewed by Marculescu, et al. . TB spreads to TJA via hematogenous dissemination from distant disease foci or by local reactivation of latent TB. A recent systematic review identified only 15 cases affecting TKA from 1982 to 2012 . The mean patient age was 70 years. Forty percent of patients had compromised immune systems, 20% had a history of TB infection, and one third had additional foci of active TB infection at the time of PJI diagnosis . A similar profile exists for THA PJI associated with TB . Fungal PJIs represent approximately 1% of all PJIs . Molds, yeasts, or dimorphic fungi are part of the fungi kingdom. Hyphae are characteristic of multicellular molds. In contrast, yeasts are single cells, and dimorphic fungi can exist as molds or yeast . Isolation of fungi from tissues or joint aspirations in symptomatic patients is diagnostic for fungal PJI. Biofilm formation is a critical virulence factor for fungi. Candida albicans, the most commonly isolated species from fungal PJI, produces larger and more complex biofilms compared to other Candida species, and biofilm facilitates rapid antifungal resistance . Nearly half of published cases of fungal PJI affecting TKA are in patients with DM or prior PJI with prolonged antibiotic therapy . Additionally, immunosuppression, malignancy, drug abuse, prolonged use of antibiotics, presence of indwelling catheters, malnutrition, RA, history of multiple abdominal surgeries, severe burns, and TB are all risk factors for fungal PJI [50, 51]. Up to 82% of affected patients have at least one of these risk factors . Isolating the offending microorganism is paramount for PJI treatment success . However, a significant number of culture-negative PJI continue to vex clinicians and patients. Aggarwal, et al. found that culture-negative PJIs accounted for 15.8% of US cases and 16.1% of European cases, and a high percentage of culture-negative PJIs have been reported in other published series [11, 12, 52]. For example, in a retrospective review of 785 PJIs treated with 2-stage exchange arthroplasty over a 14-year period at a single institution, Bjerke-Kroll, et al. found that 21.3% of cases were culture-negative. Using current standards for defining PJI, culture-negative cases can exceed 30% . There are several potential reasons for the prevalence of culture-negative PJI: preemptive antimicrobial therapy, and inadequate culture techniques and protocols. Perhaps the most common cause of culture-negative PJI is administration of antibiotics prior to obtaining fluid or tissue samples from the affected joint [53-55]. Berbari et al. found that 53% of patients with culture-negative PJI received antibiotics prior to fluid or tissue cultures. Culture yields can be improved, if antimicrobial therapy can be safely held at least two weeks before surgical intervention or aspiration [54, 55]. Furthermore, preemptive antibiotic administration prior to making a definitive PJI diagnosis potentially alters the synovial fluid leukocyte count and differential, further complicating and potentially delaying appropriate treatment . Therefore, the American Academy of Orthopaedic Surgeons (AAOS) Clinical Practice Guideline on the Diagnosis of PJIs of the Hip and Knee strongly recommends against preemptive initiation of antibiotics in patients with suspected PJI for whom definitive diagnostic tests have not been performed, and they recommend withholding antimicrobial therapies for at least two weeks before obtaining joint cultures . Inadequate culture techniques and protocols may fail to isolate the causative pathogen. First, inappropriate sampling and processing techniques can impede culture yields. Bacteriostatic agents, such as local anesthetics and saline, should not be used prior to obtaining fluid or tissue samples , and specimens should be transferred and processed immediately in the microbiology lab . Use of aerobic and anaerobic blood culture flasks can improve culture sensitivity, specificity, and positive and negative predictive values . Second, atypical organisms, such as fungi and mycobacteria, require specialized growth media , and fastidious organisms, like Propionibacterium acnes (P. acnes), require incubation up to 21-days for isolation . Third, traditional culture techniques are less effective in the setting of chronic versus acute infection , because organisms may produce and become encapsulated in biofilm and traditional culture techniques rely on isolation of free-floating (i.e., planktonic) organisms . Sonication of the explanted prosthesis is a method of biofilm disruption which improves culture yields, but it is not broadly utilized . Diagnosis of PJI can be challenging and relies on a detailed history and physical examination along with radiographic review and serological tests [62, 63]. The index of suspicion for PJI is elevated in patients presenting with a painful or stiff TJA who report a history of recent bacteremia, prior SSI or draining wound, multiple operations on the same joint, prior PJI, and comorbidities increasing their odds for PJI. Wound dehiscence, joint swelling, erythema and warmth are exam findings suggestive of PJI , while sinus tracts are diagnostic . Radiographs are typically unremarkable , but fungal PJIs frequently present with radiographic signs of loosening . Additionally, loosening or osteolysis within 5 years of a primary TJA and subperiosteal elevation are suggestive of infection on plain radiographs . Routine nuclear scintigraphy and axial imaging are not recommended . Bone scans are non-specific for failure mechanisms of TJA . For experienced radiologists, magnetic resonance imaging (MRI) with scan sequences suppressing metal artifact can identify soft tissue collections and sinus tracts. Characteristically, the synovium around PJI is hyperintense and lamellated, and there is edema in the extra-articular soft tissues . Gram stain  and serum leukocyte counts  have poor diagnostic reliability for PJI. Therefore, most studies have focused on defining diagnostic thresholds for nonspecific, broadly available laboratory tests: erythrocyte sedimentation rate (ESR), serum C-reactive protein (CRP) level, and synovial fluid white blood cell (WBC) count and differential [70, 71]. To assist mitigating some of the uncertainty regarding the definition of PJI, the Musculoskeletal Infection Society (MSIS) issued a consensus statement, to define PJI for research and also clinical practice . The MSIS definition is based on major and minor criteria to identify PJI (Table 1). Any major criterion or co-presentation of any 4 of the minor criteria satisfies the PJI definition. Table 1. MSIS workgroup standard definition for periprosthetic joint infection*. These criteria may be best applied to TJA performed more than 6 weeks after surgery , as different thresholds for serum ESR, serum CRP, and synovial leukocyte count and differential are required in the acute postoperative period [63, 72, 73]. ESR likely has limited utility in the acute postoperative period . Bedair, et al. and Yi, et al. defined the optimal cut-off values for serum CRP and synovial WBC count and differential in the acute postoperative period for TKA and THA, respectively (Table 2). Table 2. Laboratory threshold values for acute periprosthetic joint infection of the knee and hip. TKA = total knee arthroplasty; THA = total hip arthroplasty; CRP = C-reactive protein; PMN = polymorphonuclear. Additionally, serum 1,3 β-D-glucan test for Candida species may prove useful for diagnosis and monitoring treatment for candidal PJI . Histologic analyses are invasive, and their use should probably be limited to tissue samples obtained intraoperatively or to biopsy specimens from patients with a high pretest probability of infection. These assessments have diagnostic value, however. In a recent systematic review and meta-analysis, Tsaras, et al. identified 26 studies reporting results for 3,269 patients receiving revision THA and TKA. Nearly a quarter of patients had confirmed PJI. The purpose of the study was to determine the utility of intraoperative frozen section analysis for distinguishing between patients with confirmed PJI and those revised for aseptic failure. The authors found that intraoperative frozen section analysis had a very good pooled positive likelihood ratio (12.0, 95% confidence interval [CI], 8.4-17.2), and moderate accuracy, with a pooled negative likelihood ratio of 0.23 (95% CI, 0.15-0.35). The optimal threshold concentration of polymorphonuclear leukocytes (PMN) per high-powered field (HPF) for diagnosing PJI using histologic analysis is controversial, and this study was unable to detect a significant difference between the diagnostic accuracy of 5 or 10 PMNs/HPF . Multiple positive cultures are most confirmatory for PJI. The AAOS Clinical Practice Guideline strongly advises preoperative aspiration for culture, along with multiple intraoperative cultures from synovial fluid and tissue . If a negative preoperative aspiration is obtained in the setting of elevated synovial and serum markers suggestive of infection, repeat aspiration should be performed prior to surgery or initiation of antimicrobial treatment . Two to three joint aspirations may be necessary to detect fungal PJI . Intraoperatively, synovial fluid and tissue should be cultured directly, and the use of swabs is discouraged . Expert opinion suggests meticulous soft tissue handling and systematic selection of tissue samples, to prevent false-positive cultures and to improve culture yields, respectively . Tissue should be dissected sharply from the intramedullary canal and implant-bone interfaces, and specimens should be directly transferred into appropriate culture containers with clean instruments . Atkins, et al. found that 5 or 6 periprosthetic samples should be collected to maximize the sensitivity and specificity of tissue culture. Blood culture flasks should be used for synovial fluid , and specialized media are required for suspected atypical infections, such as Lowenstein-Jensen media for mycobacteria  or Sabouraud’s dextrose agar for fungi . If preoperative cultures are negative or if P. acnes, fungi or mycobacterium are suspected, prolonged culture incubation for 14 to 21 days should be considered . Cultures for mycobacterium and fungi should not be routine, since that practice is not cost-effective . If available, sonication of the retrieved prosthesis can retrieve viable microorganisms from biofilm and improve the sensitivity of cultures . Culture and histology data, on which the MSIS definition partially relies, are not immediately available in the clinic, where the diagnosis may be ambiguous. The absence of less invasive, sensitive, specific and expeditious diagnostic tests for PJI has in large part stimulated interest in molecular diagnostics [52, 80]. Synovial fluid biomarkers include inflammatory cytokines and host antimicrobial proteins expressed in response to pathogens . Leukocyte esterase strips are simple, inexpensive and widely available. In one study, using positive cultures as the reference standard, this test had sensitivity and specificity of 93.3% and 77.0%, respectively . However, interpretation of the test result can be subjective, and in 29.2% of samples blood or debris prevented discrimination between positive and negative results . A novel antimicrobial peptide test for human α-defensin has displayed promising results for diagnosing PJI [52, 66], and it outperformed the leukocyte esterase test based on its sensitivity, although both exhibited near-perfect specificity for PJI in one study . α-defensin is produced by neutrophils as part of the innate immune system and disrupts pathogen cell membranes causing their death . Deirmengian, et al. prospectively evaluated synovial fluid aspirates for CRP and α-defensin from 112 patients without PJI and from 37 patients meeting the MSIS definition for PJI. Thresholds for positive tests were >3.0 mg/L for synovial CRP and >1.0 signal-to-cutoff ratio for α-defensin. The combination of the two tests demonstrated a sensitivity of 97% and specificity of 100% for PJI. Synovial α-defensin alone had a sensitivity and specificity of 97% and 96%, respectively. Results were not influenced by concurrent antibiotic therapy or presence of systemic inflammatory disease. Of note, 35% of cases classified as PJI were culture-negative, suggesting that the α-defensin test may have particular diagnostic benefit in these cases. The one false-negative result which affected sensitivity of the test was attributable to a patient classified as having PJI, although the patient displayed only 3 of 6 minor MSIS criteria and no major criteria. No histology was available for review for this patient, and the patient was treated with a 2-stage exchange arthroplasty . Importantly, α-defensin appears to be a reliable test regardless of the organism, its virulence, or the joint affected . The major limitation of biomarkers is their inability to specify the causative pathogen or its antimicrobial sensitivities. Genetically based diagnostic tests, such as polymerase chain reaction (PCR) technology, can potentially identify organism species [85, 86] and detect genetic elements conferring antimicrobial resistance, such as the mecA gene . Jacovides, et al. also demonstrated the value of PCR-based testing for culture-negative cases. Multiple PCR-based techniques are available that use primers for DNA, ribosomal RNA, and messenger RNA [85-88]. Currently, these techniques are not commonly used in the clinical setting because of their cost and high false-positive rates . At this time, consensus opinion recommends nucleic acid-based testing as a diagnostic tool of last resort, when there remains a significant clinical concern for PJI but other confirmatory tests are inconclusive . The optimal management for PJI is prevention. Several recent reviews have highlighted the importance of preoperative medical optimization , appropriate surgical attire and draping [26, 90], appropriate selection and timing of perioperative prophylactic antibiotics , optimizing blood management protocols to limit allogeneic transfusion , and implementation of prudent anticoagulant guidelines . Preoperative screening and decolonization for nasal MRSA was reviewed by Goyal, et al. . Although it remains a controversial topic and there is recent strong consensus against universal screening and decolonization of all patients undergoing TJA , available evidence suggests that screening (particularly with cultures versus PCR testing), decolonization with intranasal mupirocin and chlorhexidine soap baths, and perioperative vancomycin for MRSA-positive patients is likely a cost-effective paradigm to prevent MRSA PJI . Additionally, novel implants that have surface treatments minimizing microbial adhesion are on the horizon, preventing biofilm formation, and exhibiting bacteriocidal properties . Once diagnosed, the treatment of PJI due to resistant organisms is the same as that for sensitive organisms. However, particular consideration should be given to obtaining consultation with an infectious disease specialist, when faced with PJI associated with resistant microbes, atypical organisms, or culture-negative results. In general, surgical strategies are distinguished by retention or exchange of the prosthesis and by whether or not the definitive reconstruction is immediate or delayed. When the primary prosthesis is retained, an irrigation and debridement with or without exchange of modular components is performed. For exchange arthroplasty, revision prosthesis is implanted, as part of a single-stage approach with a thorough irrigation and debridement, or it is delayed, as part of a two-stage strategy. For two-stage exchange, all prosthetic components are explanted and a temporary antibiotic spacer is implanted. After a period of systemic antibiotic treatment, the second stage is performed, in which the spacer is removed and a definitive revision reconstruction is performed. Commonly, systemic therapy is continued until clinical signs of infection remit, serum markers normalize, and aspiration cultures taken at least two weeks after cessation of antimicrobial administration are negative. If cultures or serology remain positive, the spacer should be exchanged and systemic therapy repeated in consultation with an infectious disease specialist. Two-stage exchange arthroplasty remains the treatment standard for chronic PJI, and published success rates range between 65% and 98% [93-95]. Few studies have specifically analyzed the two-stage approach for PJI with resistant organisms, but the published success rates in these reports range from 48% to 89% [96-103]. If available, preoperative cultures and their susceptibilities should guide antibiotic choice for cement spacers . There is no difference in reinfection rates for static versus articulating antimicrobial spacers for PJI of the knee, but range of motion is significantly better after final reconstruction for patients treated with articulating spacers . If there is severe bone or soft tissue insufficiency leading to instability, static spacers may be preferred . Proponents of single-stage and prosthesis retention strategies argue that two-stage exchange is associated with increased morbidity and mortality, and costs exceed those of a one-stage approach . They contend that success for single-stage treatment is dependent on the thoroughness of the debridement, and experienced centers report re-infection rates that are comparable with those published for two-stage exchange [107, 108]. However, expert consensus recommends restricting prosthesis retention strategies to acute infections, since evidence for this approach in other clinical scenarios is limited [109-113]. Evidence potentially supporting prosthesis retention for resistant PJI is scant and heterogeneous [108, 114-117]. For MRSA PJI this approach is associated with a high rate of failure [97, 112, 118, 119], suggesting that MRSA may represent a contraindication to prosthetic retention. Furthermore, consensus of the International Consensus Meeting on PJI advises against single-stage irrigation and debridement for PJI associated with resistant organisms, and it maintains that a two-stage approach should be used to treat PJI with these pathogens . High-level evidence guiding route and duration of systemic therapy does not exist. Perioperatively, prophylactic antibiotics do not necessarily affect culture yields with contemporary techniques . AAOS Guidelines suggest that preoperative antibiotics should only be held for patients in whom there is an elevated suspicion for PJI (e.g., elevated serum and/or synovial markers) and no organism has been isolated from repeated preoperative aspirations . There is strong consensus that postoperative antimicrobial treatment should be tailored according to susceptibility results from cultures of isolated organisms, and intravenous agents should be used initially in order to achieve a minimum inhibitory concentration of antibiotics rapidly . The duration of antibiotics should be at least 2 weeks and more typically 6 to 12 weeks . Westrich, et al. found that 91.2% of resistant PJIs could be eradicated with 2-stage exchange arthroplasty, antibiotic-loaded bone cement spacers, and 6 weeks of targeted systemic antimicrobial therapy, following a strict intravenous antibiotic regimen that maintains a post-peak serum bacterial titer (SBT) of 1:8. The SBT strategy maintains a minimum antimicrobial potency systemically, which is believed to be critical for the consistent results observed with this approach [106, 123]. Debridement, antibiotic and implant retention has excellent results for non-resistant Streptococcal PJI, with 100% success in one series of 14 cases . However, prosthesis retention has been significantly associated with treatment failure of Enterococcal PJIs, particularly if they present greater than 2 years after the index arthroplasty . Therefore, 2-stage exchange arthroplasty is the recommended surgical management for these PJIs. Additionally, diagnosis of Enterococcal PJI within two years of primary surgery, the presence of any comorbidity, associated polymicrobial infection, infection with E. faecium (versus E. faecalis), fever and elevated serum leukocyte count (>10,000 cells/mm3) at presentation are significantly associated with treatment failure . Tornero, et al. did not present susceptibility data for Enterococci in their large series of PJI with these organisms, but addition of rifampin in combination with other antibiotics was associated with treatment success in acute Enterococcal PJIs treated with either debridement or two-stage exchange arthroplasty. Vancomycin, linezolid, ampicillin, and daptomycin were all used as first-line agents in this series . Ampicillin or vancomycin is usually adequate for non-resistant Enterococcal PJI . For late PJI treated with 2-stage exchange, the treatment success is up to 92-94% [37, 125]. Treatment of PJI presenting at earlier time points and with other surgical approaches may have failure rates of at least 50% . Results from Rasouli, et al. support that implant retention for Enterococcal PJI has a failure rate in excess of 70%. Ries  reported the first two TKA PJI cases with VRE. Both patients failed reconstruction and eventually had serial open debridements. One patient was managed definitively with resection arthroplasty and the other with knee arthrodesis, which required multiple procedures . Rasouli, et al. published a series of Enterococcal PJIs including 12 cases of VRE PJIs. Fifty eight percent of cases were THAs. Systemic therapy with linezolid or daptomycin was used for four to six weeks. Overall, 66.7% required at least one reoperation for definitive management. Three patients were managed with initial irrigation and debridement, all of whom failed this treatment, and two patients required eventual resection arthroplasty and one required fusion. Two patients were managed with resection arthroplasty initially and one of these required above knee amputation for definitive management. Two patients were managed with one-stage exchange arthroplasty; one was successful and the other required subsequent irrigation and debridement. Five patients were treated with two-stage exchange initially. Two of these were successful. One required repeat 2-stage exchange, one required resection, and one required a spacer exchange prior to definitive reconstruction . This series highlights the therapeutic challenges VRE poses. Eradication of Gram-negative PJIs can be difficult [43, 127]. Zmistowski, et al. and Hsieh, et al. reviewed two of the largest series of GN PJIs, comprising 31 and 53 cases, respectively. In the former study , all patients received at least 6 weeks of intravenous antibiotics directed at the susceptibility of the isolated organism, regardless of surgical management. Seventy percent of acute PJIs treated with irrigation and debridement achieved treatment success, and 75% of chronic PJIs and patients failing irrigation and debridement for acute PJI who completed 2-stage exchange arthroplasty achieved treatment success. The overall success rate for planned 2-stage exchange was 52.2%, as 7 patients did not undergo reimplantation . Hsieh, et al. reported that only 27% of GN PJIs were successfully managed with a prostheses retention approach, and the overall success rate of 2-stage exchange was 69%. Across the two series, eradication of GN organisms and joint reconstruction was accomplished in 61.2%  and 53.5%  of cases. No high level evidence exists regarding the optimal treatment of mycobacterial PJIs. For TKAs infected with TB, nearly 90% of cases receive surgical intervention along with systemic anti-tuberculosis medications (ATM), and 80% of patients achieve a satisfactory, disease-free outcome . Since TB is planktonic and does not form a biofilm, it is more susceptible to systemic ATM and prosthetic retention is possible, provided it is well fixed and there is no evidence of bone destruction. The Infectious Diseases Society of America (IDSA) guidelines  recommend 6 to 9 months of ATM using 3 to 4 drugs, including 2 months of isoniazid (INH), rifampin (RMP), pyrazinamide (PZA), and optional ethambutol (EMB) provided susceptibility to INH, RMP and PZA. The first two months of treatment are followed by 4 to 7 months of INH and RMF. Rapidly growing NTM, such as M. fortuitum and M. chelonae, are usually resistant to INH, RMP and EMB, and susceptibility testing should be performed against amikacin, cefoxitin, clarythromycin, doxycycline, imipenem, sulfonamides, fluoroquinolones, tobramycin (M. chelonae only), and linezolid . For M. fortuitum, antimicrobial resistance can develop during treatment, despite use of multidrug regimens, and repeat susceptibility testing should be considered, especially if there is concern for treatment failure . For rapidly growing NTM, irrigation and debridement with prosthesis retention is likely inadequate surgical management. Exchange arthroplasty followed by prolonged antibiotic therapy (e.g., 6 weeks of intravenous therapy and 3 to 6 months of oral treatment) may provide the greatest chance for disease eradication . Consensus opinion strongly recommends 2-stage exchange arthroplasty for fungal PJIs [50, 51]. In the largest study addressing the subject, Azzam, et al. reviewed 31 patients from six centers with fungal PJIs. Over 70% of patients treated with irrigation and debridement failed this intervention and required resection arthroplasty. Yet, only 9 of the 29 patients (31%) undergoing resection arthroplasty underwent eventual eradication of their infection and delayed reconstruction . In a review of their case series and the literature, Kuiper, et al. analyzed 119 patients with fungal PJIs and at least 2 years of follow-up. Two-stage exchange arthroplasty was the most frequently used treatment strategy and conferred an 85% success rate . For two-stage approaches, spacers loaded with antifungal agents provide high local concentrations of these drugs . When liposomal amphotericin B is loaded in bone cement, it achieves significantly higher local levels than amphotericin B deoxycholate . Voriconazole is another appropriate antifungal option, but can compromise the compressive strength of bone cement . Addition of antibacterial agents to the bone cement may be important to prevent superimposed bacterial infection . The species of fungal isolates must be determined to dictate antifungal therapy. Antifungal susceptibility testing is not commonly utilized for fungal PJIs, but it is recommended, since fluconazole-resistant Candida species have been reported . Systemic treatment regimens for fungal PJIs are heterogeneous in the literature [47, 50], but the IDSA guidelines recommend systemic antifungal therapy for 6 weeks in cases of septic arthritis with Candida species and 6 to 12 months for osteomyelitis . Treatment of culture-negative PJI usually requires broad-spectrum antibiotics or multiple antibiotics covering the commonest causative microorganisms. The downsides of this approach are multiple. Broad-spectrum antibiotics and combination therapy increase the risk of systemic toxicity to the patient, and atypical organisms may not be covered with this strategy. For all PJIs, treatment failures are not uncommon secondary to recurrence of PJI with the primary organism and infection by novel organisms . Patients who fail multiple treatment attempts may require salvage procedures including fusion, resection arthroplasty, and amputation . The potential public health and economic threat posed by the increasing number of all PJIs and antibiotic-resistant PJIs is staggering. The prevalence of PJIs caused by methicillin-resistant Staphylococci in Europe and the US continues to rise, although the epidemiology of causative microorganisms in PJI exhibits geographic variation. Additional research is needed to define the optimal treatment of PJIs associated with rare pathogens, such as VRE, fungi and mycobacteria. Promising diagnostic tests are on the horizon, such as human α-defensin, but inexpensive, reliable tests that rapidly detect specific microbial species and antimicrobial susceptibilities would be advantageous. Antimicrobial therapy should be directed toward culture susceptibilities. The duration of systemic antimicrobial therapy is typically 6 weeks, with a minimum of 2 weeks of parenteral therapy. Two-stage exchange arthroplasty remains the gold standard for surgical management of chronic PJIs, especially when the causative organism is a resistant microbe or produces biofilm. Additional research is required to define organisms, clinical scenarios, surgical techniques, and antimicrobial regimens that allow for reproducible treatment success with prosthetic retention strategies. Cram P, Lu X, Kates SL, Singh JA, Li Y, Wolf BR. Total knee arthroplasty volume, utilization, and outcomes among Medicare beneficiaries, 19912010. JAMA 2012; 308(12): 1227-36. Della Valle C, Parvizi J, Bauer TW, et al. Diagnosis of periprosthetic joint infections of the hip and knee. J Am Acad Orthop Surg 2010; 18(12): 760-70. Parvizi J, Saleh KJ, Ragland PS, Pour AE, Mont MA. Efficacy of antibiotic-impregnated cement in total hip replacement. Acta Orthop 2008; 79(3): 335-41. Kurtz SM, Lau E, Watson H, Schmier JK, Parvizi J. Economic burden of periprosthetic joint infection in the United States. J Arthroplasty 2012; 27(8)(Suppl. ): 61-5.e1. Helwig P, Morlock J, Oberst M, et al. Periprosthetic joint infectioneffect on quality of life. Int Orthop 2014; 38(5): 1077-81. Parvizi J, Pawasarat IM, Azzam KA, Joshi A, Hansen EN, Bozic KJ. Periprosthetic joint infection: the economic impact of methicillin-resistant infections. J Arthroplasty 2010; 25(6)(Suppl. ): 103-7. Anderson DJ, Sexton DJ, Kanafani ZA, Auten G, Kaye KS. Severe surgical site infection in community hospitals: epidemiology, key procedures, and the changing prevalence of methicillin-resistant Staphylococcus aureus. Infect Control Hosp Epidemiol 2007; 28(9): 1047-53. Parvizi J, Adeli B, Zmistowski B, Restrepo C, Greenwald AS. Management of periprosthetic joint infection: the current knowledge: AAOS exhibit selection. J Bone Joint Surg Am 2012; 94(14): e104. Parvizi J, Erkocak OF, Della Valle CJ. Culture-negative periprosthetic joint infection. J Bone Joint Surg Am 2014; 96(5): 430-6. Bjerke-Kroll BT, Christ AB, McLawhorn AS, Sculco PK, Jules-Elysée KM, Sculco TP. Periprosthetic joint infections treated with two-stage revision over 14 years: an evolving microbiology profile. J Arthroplasty 2014; 29(5): 877-82. Bozic KJ, Kurtz SM, Lau E, Ong K, Vail TP, Berry DJ. The epidemiology of revision total hip arthroplasty in the United States. J Bone Joint Surg Am 2009; 91(1): 128-33. Bozic KJ, Kurtz SM, Lau E, et al. The epidemiology of revision total knee arthroplasty in the United States. Clin Orthop Relat Res 2010; 468(1): 45-51. Parvizi J, Ghanem E, Azzam K, Davis E, Jaberi F, Hozack W. Periprosthetic infection: are current treatment strategies adequate? Acta Orthop Belg 2008; 74(6): 793-800. Aggarwal VK, Bakhshi H, Ecker NU, Parvizi J, Gehrke T, Kendoff D. Organism profile in periprosthetic joint infection: pathogens differ at two arthroplasty infection referral centers in Europe and in the United States. J Knee Surg 2014; 27(5): 399-406. Bozic KJ, Lau E, Kurtz S, et al. Patient-related risk factors for periprosthetic joint infection and postoperative mortality following total hip arthroplasty in Medicare patients. J Bone Joint Surg Am 2012; 94(9): 794-800. Bozic KJ, Lau E, Kurtz S, Ong K, Berry DJ. Patient-related risk factors for postoperative mortality and periprosthetic joint infection in medicare patients undergoing TKA. Clin Orthop Relat Res 2012; 470(1): 130-7. Zhu Y, Zhang F, Chen W, Liu S, Zhang Q, Zhang Y. Risk factors for periprosthetic joint infection after total joint arthroplasty: a systematic review and meta-analysis. J Hosp Infect 2015; 89(2): 82-9. Haley RW, Culver DH, Morgan WM, White JW, Emori TG, Hooton TM. Identifying patients at high risk of surgical wound infection. A simple multivariate index of patient susceptibility and wound contamination. Am J Epidemiol 1985; 121(2): 206-15. Lieberman JR, Fuchs MD, Haas SB, et al. Hip arthroplasty in patients with chronic renal failure. J Arthroplasty 1995; 10(2): 191-5. Ritter MA, Fechtman RW. Urinary tract sequelae: possible influence on joint infections following total joint replacement. Orthopedics 1987; 10(3): 467-9. Cordero-Ampuero J, de Dios M. What are the risk factors for infection in hemiarthroplasties and total hip arthroplasties? Clin Orthop Relat Res 2010; 468(12): 3268-77. Aggarwal VK, Tischler EH, Lautenbach C, et al. Mitigation and education. J Orthop Res 2014; 32(Suppl. 1): S16-25. Matar WY, Jafari SM, Restrepo C, Austin M, Purtill JJ, Parvizi J. Preventing infection in total joint arthroplasty. J Bone Joint Surg Am 2010; 92(Suppl. 2): 36-46. Marculescu CE, Berbari EF, Cockerill FR III, Osmon DR. Fungi, mycobacteria, zoonotic and other organisms in prosthetic joint infection. Clin Orthop Relat Res 2006; 451(451): 64-72. DeLeo FR, Otto M, Kreiswirth BN, Chambers HF. Community-associated meticillin-resistant Staphylococcus aureus. Lancet 2010; 375(9725): 1557-68. Goyal N, Miller A, Tripathi M, Parvizi J. Methicillin-resistant Staphylococcus aureus (MRSA): colonisation and pre-operative screening. Bone Joint J 2013; 95-B(1): 4-9. Chambers HF. Methicillin resistance in staphylococci: molecular and biochemical basis and clinical implications. Clin Microbiol Rev 1997; 10(4): 781-91. Ando E, Monden K, Mitsuhata R, Kariyama R, Kumon H. Biofilm formation among methicillin-resistant Staphylococcus aureus isolates from patients with urinary tract infection. Acta Med Okayama 2004; 58(4): 207-14. Vandenesch F, Naimi T, Enright MC, et al. Community-acquired methicillin-resistant Staphylococcus aureus carrying Panton-Valentine leukocidin genes: worldwide emergence. Emerg Infect Dis 2003; 9(8): 978-84. Kocsis E, Kristof K, Hermann P, Rozgonyi F. A comparative review on the pathogenicity and virulence factors of methicillin resistant and methicillin susceptible Staphylococcus aureus. Rev Med Microbiol 2010; 21(2): 31-7. Diekema DJ, Richter SS, Heilmann KP, et al. Continued emergence of USA300 methicillin-resistant Staphylococcus aureus in the United States: results from a nationwide surveillance study. Infect Control Hosp Epidemiol 2014; 35(3): 285-92. Cui L, Isii T, Fukuda M, et al. An RpoB mutation confers dual heteroresistance to daptomycin and vancomycin in Staphylococcus aureus. Antimicrob Agents Chemother 2010; 54(12): 5222-33. Morales G, Picazo JJ, Baos E, et al. Resistance to linezolid is mediated by the cfr gene in the first report of an outbreak of linezolid-resistant Staphylococcus aureus. Clin Infect Dis 2010; 50(6): 821-5. Tornero E, Senneville E, Euba G, et al. Characteristics of prosthetic joint infections due to Enterococcus sp. and predictors of failure: a multi-national study. Clin Microbiol Infect 2014; 20(11): 1219-24. Rasouli MR, Tripathi MS, Kenyon R, Wetters N, Della Valle CJ, Parvizi J. Low rate of infection control in enterococcal periprosthetic joint infections. Clin Orthop Relat Res 2012; 470(10): 2708-16. Reynolds PE, Courvalin P. Vancomycin resistance in enterococci due to synthesis of precursors terminating in D-alanyl-D-serine. Antimicrob Agents Chemother 2005; 49(1): 21-5. Billot-Klein D, Blanot D, Gutmann L, van Heijenoort J. Association constants for the binding of vancomycin and teicoplanin to N-acetyl-D-alanyl-D-alanine and N-acetyl-D-alanyl-D-serine. Biochem J 1994; 304(Pt 3): 1021-2. Krzyściak W, Pluskwa KK, Jurczak A, Kościelniak D. The pathogenicity of the Streptococcus genus. Eur J Clin Microbiol Infect Dis 2013; 32(11): 1361-76. Apsingi S, Kulkarni A, Gould KF, McCaskie AW. Late Streptococcus bovis infection of knee arthroplasty and its association with carcinoma of the colon: a case report. Knee Surg Sports Traumatol Arthrosc 2007; 15(6): 761-2. Berbari EF, Hanssen AD, Duffy MC, Steckelberg JM, Osmon DR. Prosthetic joint infection due to Mycobacterium tuberculosis: a case series and review of the literature. Am J Orthop 1998; 27(3): 219-7. Kim SJ, Kim JH. Late onset Mycobacterium tuberculosis infection after total knee arthroplasty: a systematic review and pooled analysis. Scand J Infect Dis 2013; 45(12): 907-14. Shanbhag V, Kotwal R, Gaitonde A, Singhal K. Total hip replacement infected with Mycobacterium tuberculosis. A case report with review of literature. Acta Orthop Belg 2007; 73(2): 268-74. Azzam K, Parvizi J, Jungkind D, et al. Microbiological, clinical, and surgical features of fungal prosthetic joint infections: a multi-institutional experience. J Bone Joint Surg Am 2009; 91(Suppl. 6): 142-9. OShaughnessy EM, Shea YM, Witebsky FG. Laboratory diagnosis of invasive mycoses. Infect Dis Clin North Am 2003; 17(1): 135-58. Kuhn DM, Chandra J, Mukherjee PK, Ghannoum MA. Comparison of biofilms formed by Candida albicans and Candida parapsilosis on bioprosthetic surfaces. Infect Immun 2002; 70(2): 878-88. Gebauer M, Frommelt L, Achan P, et al. Management of fungal or atypical periprosthetic joint infections. J Arthroplasty 2014; 29(2)(Suppl. ): 112-4. Kuiper JW, van den Bekerom MP, van der Stappen J, Nolte PA, Colen S. 2-stage revision recommended for treatment of fungal hip and knee prosthetic joint infections. Acta Orthop 2013; 84(6): 517-23. Deirmengian C, Kardos K, Kilmartin P, Cameron A, Schiller K, Parvizi J. Combined measurement of synovial fluid α-Defensin and C-reactive protein levels: highly accurate for diagnosing periprosthetic joint infection. J Bone Joint Surg Am 2014; 96(17): 1439-45. Berbari EF, Marculescu C, Sia I, et al. Culture-negative prosthetic joint infection. Clin Infect Dis 2007; 45(9): 1113-9. Trampuz A, Piper KE, Jacobson MJ, et al. Sonication of removed hip and knee prostheses for diagnosis of infection. N Engl J Med 2007; 357(7): 654-63. Burnett RS, Kelly MA, Hanssen AD, Barrack RL. Technique and timing of two-stage exchange for infection in TKA. Clin Orthop Relat Res 2007; 464(464): 164-78. Della Valle C, Parvizi J, Bauer TW, et al. American Academy of Orthopaedic Surgeons clinical practice guideline on: the diagnosis of periprosthetic joint infections of the hip and knee. J Bone Joint Surg Am 2011; 93(14): 1355-7. Font-Vizcarra L, García S, Martínez-Pastor JC, Sierra JM, Soriano A. Blood culture flasks for culturing synovial fluid in prosthetic joint infections. Clin Orthop Relat Res 2010; 468(8): 2238-43. Zappe B, Graf S, Ochsner PE, Zimmerli W, Sendi P. Propionibacterium spp. in prosthetic joint infections: a diagnostic challenge. Arch Orthop Trauma Surg 2008; 128(10): 1039-46. Parvizi J, Ghanem E, Sharkey P, Aggarwal A, Burnett RS, Barrack RL. Diagnosis of infected total knee: findings of a multicenter database. Clin Orthop Relat Res 2008; 466(11): 2628-33. Zmistowski B, Della Valle C, Bauer TW, et al. Diagnosis of periprosthetic joint infection. J Arthroplasty 2014; 29(2)(Suppl. ): 77-83. New definition for periprosthetic joint infection. J Arthroplasty 2011; 26(8): 1136-8. Tigges S, Stiles RG, Roberson JR. Appearance of septic hip prostheses on plain radiographs. AJR Am J Roentgenol 1994; 163(2): 377-80. Love C, Marwin SE, Palestro CJ. Nuclear medicine and the infected joint replacement. Semin Nucl Med 2009; 39(1): 66-78. Hayter CL, Koff MF, Potter HG. Magnetic resonance imaging of the postoperative hip. J Magn Reson Imaging 2012; 35(5): 1013-25. Zywiel MG, Stroh DA, Johnson AJ, Marker DR, Mont MA. Gram stains have limited application in the diagnosis of infected total knee arthroplasty. Int J Infect Dis 2011; 15(10): e702-5. Toossi N, Adeli B, Rasouli MR, Huang R, Parvizi J. Serum white blood cell count and differential do not have a role in the diagnosis of periprosthetic joint infection. J Arthroplasty 2012; 27(8)(Suppl. ): 51-4.e1. Ghanem E, Antoci V Jr, Pulido L, Joshi A, Hozack W, Parvizi J. The use of receiver operating characteristics analysis in determining erythrocyte sedimentation rate and C-reactive protein levels in diagnosing periprosthetic infection prior to revision total hip arthroplasty. Int J Infect Dis 2009; 13(6): e444-9. Ghanem E, Parvizi J, Burnett RS, et al. Cell count and differential of aspirated fluid in the diagnosis of infection at the site of total knee arthroplasty. J Bone Joint Surg Am 2008; 90(8): 1637-43. Bedair H, Ting N, Jacovides C, et al. The Mark Coventry Award: diagnosis of early postoperative TKA infection using synovial fluid analysis. Clin Orthop Relat Res 2011; 469(1): 34-40. Yi PH, Cross MB, Moric M, Sporer SM, Berger RA, Della Valle CJ. The 2013 Frank Stinchfield Award: Diagnosis of infection in the early postoperative period after total hip arthroplasty. Clin Orthop Relat Res 2014; 472(2): 424-9. Ostrosky-Zeichner L, Alexander BD, Kett DH, et al. Multicenter clinical evaluation of the (1>3) beta-D-glucan assay as an aid to diagnosis of fungal infections in humans. Clin Infect Dis 2005; 41(5): 654-9. Tsaras G, Maduka-Ezeh A, Inwards CY, et al. Utility of intraoperative frozen section histopathology in the diagnosis of periprosthetic joint infection: a systematic review and meta-analysis. J Bone Joint Surg Am 2012; 94(18): 1700-11. Woods GL. The mycobacteriology laboratory and new diagnostic techniques. Infect Dis Clin North Am 2002; 16(1): 127-44. Schäfer P, Fink B, Sandow D, Margull A, Berger I, Frommelt L. Prolonged bacterial culture to identify late periprosthetic joint infection: a promising strategy. Clin Infect Dis 2008; 47(11): 1403-9. Tokarski AT, ONeil J, Deirmengian CA, Ferguson J, Deirmengian GK. The routine use of atypical cultures in presumed aseptic revisions is unnecessary. Clin Orthop Relat Res 2013; 471(10): 3171-7. Gollwitzer H, Dombrowski Y, Prodinger PM, et al. Antimicrobial peptides and proinflammatory cytokines in periprosthetic joint infection. J Bone Joint Surg Am 2013; 95(7): 644-51. Wetters NG, Berend KR, Lombardi AV, Morris MJ, Tucker TL, Della Valle CJ. Leukocyte esterase reagent strips for the rapid diagnosis of periprosthetic joint infection. J Arthroplasty 2012; 27(8)(Suppl. ): 8-11. Deirmengian C, Kardos K, Kilmartin P, et al. The alpha-defensin test for periprosthetic joint infection outperforms the leukocyte esterase test strip. Clin Orthop Relat Res 2015; 473(1): 198-203. Chalifour A, Jeannin P, Gauchat JF, et al. Direct bacterial protein PAMP recognition by human NK cells involves TLRs and triggers alpha-defensin production. Blood 2004; 104(6): 1778-83. Deirmengian C, Kardos K, Kilmartin P, Gulati S, Citrano P, Booth RE Jr. The alpha-defensin test for periprosthetic joint infection responds to a wide spectrum of organisms. Clin Orthop Relat Res 2015; 473(7): 2229-35. Moojen DJ, Spijkers SN, Schot CS, et al. Identification of orthopaedic infections using broad-range polymerase chain reaction and reverse line blot hybridization. J Bone Joint Surg Am 2007; 89(6): 1298-305. Bergin PF, Doppelt JD, Hamilton WG, et al. Detection of periprosthetic infections with use of ribosomal RNA-based polymerase chain reaction. J Bone Joint Surg Am 2010; 92(3): 654-63. Tarkin IS, Henry TJ, Fey PI, Iwen PC, Hinrichs SH, Garvin KL. PCR rapidly detects methicillin-resistant staphylococci periprosthetic infection. Clin Orthop Relat Res 2003; (414): 89-94. Jacovides CL, Kreft R, Adeli B, Hozack B, Ehrlich GD, Parvizi J. Successful identification of pathogens by polymerase chain reaction (PCR)-based electron spray ionization time-of-flight mass spectrometry (ESI-TOF-MS) in culture-negative periprosthetic joint infection. J Bone Joint Surg Am 2012; 94(24): 2247-54. Moucha CS, Clyburn T, Evans RP, Prokuski L. Modifiable risk factors for surgical site infection. J Bone Joint Surg Am 2011; 93(4): 398-404. Salassa TE, Swiontkowski MF. Surgical attire and the operating room: role in infection prevention. J Bone Joint Surg Am 2014; 96(17): 1485-92. Gallo J, Holinka M, Moucha CS. Antibacterial surface treatment for orthopaedic implants. Int J Mol Sci 2014; 15(8): 13849-80. Senthi S, Munro JT, Pitto RP. Infection in total hip replacement: meta-analysis. Int Orthop 2011; 35(2): 253-60. Parvizi J, Zmistowski B, Adeli B. Periprosthetic joint infection: treatment options. Orthopedics 2010; 33(9): 659. Kim YH, Kim JS, Park JW, Joo JH. Cementless revision for infected total hip replacements. J Bone Joint Surg Br 2011; 93(1): 19-26. Parvizi J, Azzam K, Ghanem E, Austin MS, Rothman RH. Periprosthetic infection due to resistant staphylococci: serious problems on the horizon. Clin Orthop Relat Res 2009; 467(7): 1732-9. Salgado CD, Dash S, Cantey JR, Marculescu CE. Higher risk of failure of methicillin-resistant Staphylococcus aureus prosthetic joint infections. Clin Orthop Relat Res 2007; 461(461): 48-53. Kilgus DJ, Howe DJ, Strang A. Results of periprosthetic hip and knee infections caused by resistant bacteria. Clin Orthop Relat Res 2002; (404): 116-24. Leung F, Richards CJ, Garbuz DS, Masri BA, Duncan CP. Two-stage total hip arthroplasty: how often does it control methicillin-resistant infection? Clin Orthop Relat Res 2011; 469(4): 1009-15. Lim SJ, Park JC, Moon YW, Park YS. Treatment of periprosthetic hip infection caused by resistant microorganisms using 2-stage reimplantation protocol. J Arthroplasty 2009; 24(8): 1264-9. Volin SJ, Hinrichs SH, Garvin KL. Two-stage reimplantation of total joint infections: a comparison of resistant and non-resistant organisms. Clin Orthop Relat Res 2004; (427): 94-100. Murray TG, Cochran J, Klika AK, Krebs VE, Barsoum WK. Do resistant organisms affect success of two-stage reimplantation for prosthetic hip infections? Curr Orthop Pract 2011; 22(2): 180-4. Mittal Y, Fehring TK, Hanssen A, Marculescu C, Odum SM, Osmon D. Two-stage reimplantation for periprosthetic knee infection involving resistant organisms. J Bone Joint Surg Am 2007; 89(6): 1227-31. Shaikh AA, Ha CW, Park YG, Park YB. Two-stage approach to primary TKA in infected arthritic knees using intraoperatively molded articulating cement spacers. Clin Orthop Relat Res 2014; 472(7): 2201-7. Voleti PB, Baldwin KD, Lee GC. Use of static or articulating spacers for infection following total knee arthroplasty: a systematic literature review. J Bone Joint Surg Am 2013; 95(17): 1594-9. Gehrke T, Kendoff D. Peri-prosthetic hip infections: in favour of one-stage. Hip Int 2012; 22(Suppl. 8): S40-5. Winkler H, Stoiber A, Kaudela K, Winter F, Menschik F. One stage uncemented revision of infected total hip replacement using cancellous allograft bone impregnated with antibiotics. J Bone Joint Surg Br 2008; 90(12): 1580-4. Koyonos L, Zmistowski B, Della Valle CJ, Parvizi J. Infection control rate of irrigation and débridement for periprosthetic joint infection. Clin Orthop Relat Res 2011; 469(11): 3043-8. Odum SM, Fehring TK, Lombardi AV, et al. Irrigation and debridement for periprosthetic infections: does the organism matter? J Arthroplasty 2011; 26(6)(Suppl. ): 114-8. Marculescu CE, Berbari EF, Hanssen AD, et al. Outcome of prosthetic joint infections treated with debridement and retention of components. Clin Infect Dis 2006; 42(4): 471-8. Azzam KA, Seeley M, Ghanem E, Austin MS, Purtill JJ, Parvizi J. Irrigation and debridement in the management of prosthetic joint infection: traditional indications revisited. J Arthroplasty 2010; 25(7): 1022-7. Vilchez F, Martínez-Pastor JC, García-Ramiro S, et al. Efficacy of debridement in hematogenous and early post-surgical prosthetic joint infections. Int J Artif Organs 2011; 34(9): 863-9. Hansen E, Tetreault M, Zmistowski B, et al. Outcome of one-stage cementless exchange for acute postoperative periprosthetic hip infection. Clin Orthop Relat Res 2013; 471(10): 3214-22. Bori G, Muñoz-Mahamud E, Cuñé J, Gallart X, Fuster D, Soriano A. One-stage revision arthroplasty using cementless stem for infected hip arthroplasties. J Arthroplasty 2014; 29(5): 1076-81. Choi HR, Kwon YM, Freiberg AA, Malchau H. Comparison of one-stage revision with antibiotic cement versus two-stage revision results for infected total hip arthroplasty. J Arthroplasty 2013; 28(8)(Suppl. ): 66-70. Yoo JJ, Kwon YS, Koo KH, Yoon KS, Kim YM, Kim HJ. One-stage cementless revision arthroplasty for infected hip replacements. Int Orthop 2009; 33(5): 1195-201. Walls RJ, Roche SJ, ORourke A, McCabe JP. Surgical site infection with methicillin-resistant Staphylococcus aureus after primary total hip replacement. J Bone Joint Surg Br 2008; 90(3): 292-8. Bradbury T, Fehring TK, Taunton M, et al. The fate of acute methicillin-resistant Staphylococcus aureus periprosthetic knee infections treated by open debridement and retention of components. J Arthroplasty 2009; 24(6)(Suppl. ): 101-4. Parvizi J, Gehrke T, Chen AF. Proceedings of the international consensus on periprosthetic joint infection. Bone Joint J 2013; 95-B(11): 1450-2. Burnett RS, Aggarwal A, Givens SA, McClure JT, Morgan PM, Barrack RL. Prophylactic antibiotics do not affect cultures in the treatment of an infected TKA: a prospective trial. Clin Orthop Relat Res 2010; 468(1): 127-34. Restrepo C, Schmitt S, Backstein D, et al. Antibiotic treatment and timing of reimplantation. J Arthroplasty 2014; 29(2)(Suppl. ): 104-7. Betz M, Abrassart S, Vaudaux P, et al. Increased risk of joint failure in hip prostheses infected with Staphylococcus aureus treated with debridement, antibiotics and implant retention compared to Streptococcus. Int Orthop 2015; 39(3): 397-401. El Helou OC, Berbari EF, Marculescu CE, et al. Outcome of enterococcal prosthetic joint infection: is combination systemic therapy superior to monotherapy? Clin Infect Dis 2008; 47(7): 903-9. Ries MD. Vancomycin-resistant Enterococcus infected total knee arthroplasty. J Arthroplasty 2001; 16(6): 802-5. Hsieh PH, Lee MS, Hsu KY, Chang YH, Shih HN, Ueng SW. Gram-negative prosthetic joint infections: risk factors and outcome of treatment. Clin Infect Dis 2009; 49(7): 1036-43. Blumberg HM, Burman WJ, Chaisson RE, et al. American thoracic society/centers for disease control and prevention/infectious diseases society of america: treatment of tuberculosis. Am J Respir Crit Care Med 2003; 167(4): 603-62. Silverberg D, Kodali P, Dipersio J, Acus R, Askew M. In vitro analysis of antifungal impregnated polymethylmethacrylate bone cement. Clin Orthop Relat Res 2002; (403): 228-31. Cunningham B, McLaren AC, Pauken C, McLemore R. Liposomal formulation increases local delivery of amphotericin from bone cement: a pilot study. Clin Orthop Relat Res 2012; 470(10): 2671-6. Miller RB, McLaren AC, Pauken C, Clarke HD, McLemore R. Voriconazole is delivered from antifungal-loaded bone cement. Clin Orthop Relat Res 2013; 471(1): 195-200. Pappas PG, Kauffman CA, Andes D, et al. Clinical practice guidelines for the management of candidiasis: 2009 update by the Infectious Diseases Society of America. Clin Infect Dis 2009; 48(5): 503-35.